Mahogany Conference Tables - IN STOCK! Free Shipping! 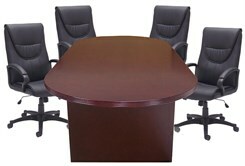 Deep, rich Mahogany wood veneer conference tables at an incredibly low Modern Office Special Offer price. For a limited time buy a genuine wood table for less than a lower quality laminate table! IN STOCK! Designed with a sophisticated, professional appearance for the executive conference room yet value priced for most any meeting room. Solid wood reeded edges are excellent for durability and are a smart design detail. Transitional design allows the table to blend with either traditional or contemporary office decor. Racetrack top design eliminates sharp corners in tight rooms and allows users to gather around the table ends if space is limited. * Substantial 1-5/8" thick table top with hardwood reeded edge treatment for a solid feel and distinctive appearance. * Satin smooth mahogany finish highlights the natural beauty of real wood. Measures 94-1/2"L x 41-3/4"W x 29-1/4"-29-3/4"H overall. Shpg. wt. 225 lbs. Ships unassembled for safety in transit. PRICE INCLUDES SHIPPING! (Truck shipment - See Terms & Conditions). IN STOCK!